Tooth & Gum Wipes . Specially formulated to help promote Dental Hygiene in your Pet. Directions Massage wipes into gums & teeth. Repeat for extra cleaning or deodorizing. John Paul Pet Tooth & Gum Wipes * Cruelty Free * * Tested on Humans First * John Paul is the co-founder of Paul Mitchell, the finest in salon hair care. Ear and Eye Wipes . Specially formulated to help remove tear stains & matter that accumulate around your Pets' eyes and ears. No scent and fragrance free. Directions Gently wipe the outer edge of eyes & ears. Repeat for extra cleaning. John Paul Pet Ear and Eye Wipes * Cruelty Free * * Tested on Humans First * John Paul is the co-founder of Paul Mitchell, the finest in salon hair care. Super Bright Shampoo . Whitening & Brightening Formula. This extraordinary formula has been developed for light colored Coats to help control matting, tangling and flyaway hair. Fortified with hydrolyzed oats, chamomile and sweet almond oil, it cleans thoroughly and rinses easily leaving a sparkling clean and shinny coat. Directions Massage into damp fur, avoiding eyes and ears. Gently use a wet sponge or washcloth on the face. Work lather down to the tail. Rinse well with cool, clear water. Repeat for extra cleaning or deodorizing. Towel dry, then brush and comb periodically until coat is completely dry. John Paul Pet Super Bright Shampoo * Cruelty Free * * Tested on Humans First * John Paul is the co-founder of Paul Mitchell, the finest in salon hair care. Oatmeal Shampoo . Sensitive skin formula. Specially formulated to help relieve skin irritations, promote healing, and moisturize dry, itchy skin with pure oatmeal, aloe vera gel and sweet almond oil. Directions Massage into damp fur, avoiding eyes and ears. Gently use a wet sponge or washcloth on the face. Work lather down to the tail. Rinse well with cool, clear water. Repeat for extra cleaning or deodorizing. Towel dry, then brush and comb periodically until coat is completely dry. John Paul Pet Oatmeal Shampoo * Cruelty Free * * Tested on Humans First * John Paul is the co-founder of Paul Mitchell, the finest in salon hair care. Tearless Gentle Shampoo . For Puppies & Kittens of Any Age. Designed for puppies & kittens with sensitive skin, the Tearless formula contains our exclusive botanical blend to condition and add luster to your pet?s coat. Directions Massage into damp fur, avoiding eyes and ears. Gently use a wet sponge or washcloth on the face. Work lather down to the tail. Rinse well with cool, clear water. Repeat for extra cleaning or deodorizing. Towel dry, then brush and comb periodically until coat is completely dry. John Paul Pet Tearless Gentle Shampoo * Cruelty Free * * Tested on Humans First * John Paul is the co-founder of Paul Mitchell, the finest in salon hair care. Waterless Foam Shampoo . For Dogs and Cats. Thick, rich foam cleans coats and soothes skin. Waterless formula requires no rinsing, great to use during colder weather or for dogs who don't like getting a bath Directions Massage into damp fur, avoiding eyes and ears. Gently use a wet sponge or washcloth on the face. Work lather down to the tail. Rinse well with cool, clear water. Repeat for extra cleaning or deodorizing. Towel dry, then brush and comb periodically until coat is completely dry. John Paul Pet Waterless Foam Shampoo * Cruelty Free * * Tested on Humans First * John Paul is the co-founder of Paul Mitchell, the finest in salon hair care. John Paul Pet Body & Paw Wipes the first comprehensive system of Pet Wipes to provide the optimum level in pet care hygiene, cleaning, deodorizing, comfort and safety. For best results, use every day. Body & Paw Wipes are specially formulated with aloe and lanolin to help remove dander, moisture dry cracked pads and remove dirt build-up in paws. Also helps deodorize and remove loose hairs from pet coats. - First-hand account of how the author investigated, and finally busted, some of the most heartless and corrupt federally licensed pet-theft rings in the nation. - Facts about our federal and local governments' involvement in the multi-million dollar pet-theft industry. - Frontline intelligence to what actually occurs in animal laboratories. Shocking, riveting and moving. Millions of animals are stolen each year and sold for experimentation and "human" consumption. DeRose doesn't hold back, exposing the horrible truths of animal research and the newest form of organized crime: pet theft. Well-known celebrities who applaud his efforts and have made their own contributions to this cause including Kim Basinger, John Travolta, Linda Blair, Tippi Hedren, Alicia Silverstone, Brigitte Bardot and John Paul Jones, to name a few. Calming Moisturizing Shampoo . Conditioning Formula. This ultra rich luxury shampoo is formulated with aloe vera gel, sweet almond oil and chamomile extracts to help nourish and replenish dry and dull coats. Directions Massage into damp fur, avoiding eyes and ears. Gently use a wet sponge or washcloth on the face. Work lather down to the tail. Rinse well with cool, clear water. Repeat for extra cleaning or deodorizing. Towel dry, then brush and comb periodically until coat is completely dry. John Paul Pet Calming Moisturizing Shampoo * Cruelty Free * * Tested on Humans First * John Paul is the co-founder of Paul Mitchell, the finest in salon hair care. Oatmeal Conditioning Rinse . Detangling Formula. This rich conditioner with our special blend of botanicals restores a silky feel to the coat, helps improve dry and wet combing, and enhances overall manageability. 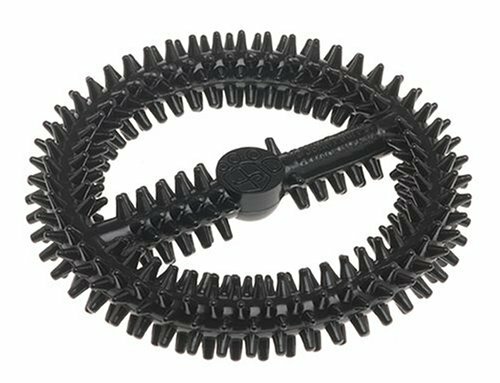 Takes out most difficult mats and tangles. Directions Massage into damp fur, avoiding eyes and ears. Gently use a wet sponge or washcloth on the face. Work lather down to the tail. Rinse well with cool, clear water. Repeat for extra cleaning or deodorizing. Towel dry, then brush and comb periodically until coat is completely dry. 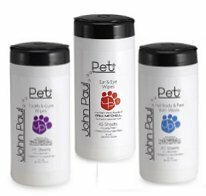 John Paul Pet Oatmeal Conditioning Rinse * Cruelty Free * * Tested on Humans First * John Paul is the co-founder of Paul Mitchell, the finest in salon hair care. John Paul Pet Puppy Pack contains Tearless Shampoo for young pets that cleans and deodorizes without irritating their sensitive eyes and face, Waterless Foam Cleanser that deeply cleans and deodorizes while gently soothing skin, and Full Body and Paw Wipes for quick clean-ups. Tea Tree Treatment Shampoo . For Fleas, Ticks and Hot Spots. Environmentally safe and effective and helps with flea, tick and biting insect control. Natural Australian Tea Tree Oil helps to heal and soothe skin irritations. Contains no DEET, pyrethrins, synthetic pyrethroids or permethrin. Directions Massage into damp fur, avoiding eyes and ears. Gently use a wet sponge or washcloth on the face. Work lather down to the tail. Rinse well with cool, clear water. Repeat for extra cleaning or deodorizing. Towel dry, then brush and comb periodically until coat is completely dry. John Paul Pet Tea Tree Treatment Shampoo * Cruelty Free * * Tested on Humans First * John Paul is the co-founder of Paul Mitchell, the finest in salon hair care.